Hey, it’s Deb again from Bowl Me Over! I know, I know – last month I shared my recipe for a Skinny Taco Salad and this is another Taco recipe…. but this is a recipe I KNOW you’re going to love…and I couldn’t wait to share it with you! Homemade Barbacoa Beef Tacos. 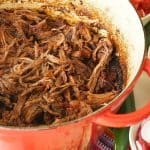 Homemade Barbacoa Beef Tacos – dine at your favorite taqueria without leaving your home! I should back up just a bit – you remember I live in Fresno, CA right? Fresno is famous for the best Mexican food around. What’s amazing is some of the tiniest spots have the very best tacos for only two dollars! Be sure to grill the tortillas. You’ll want some nice charred edges. It really adds a lot of flavor! So I decided my goal was to be able to enjoy a great taqueria meal at home, but of course it had to be easy and use ingredients you have on hand. 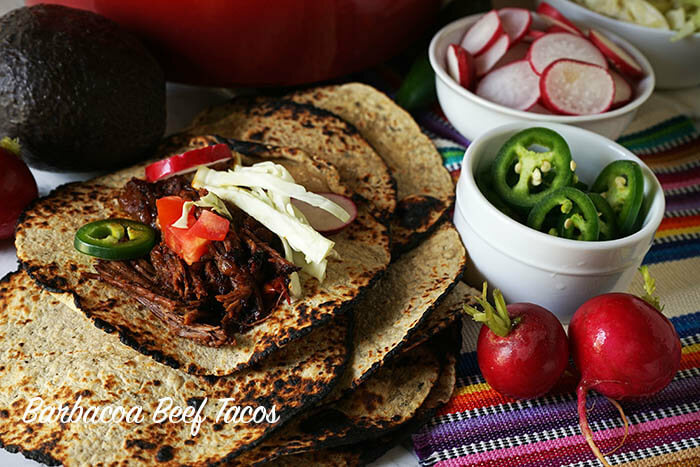 Serve up the Barbacoa Beef Tacos with all of your favorite toppings! In Fresno we keep the toppings simple – fresh jalepanos, radishes and cabbage. But you can always add in chunks of avocado, a squeeze of fresh lime and some nice spicy salsa! 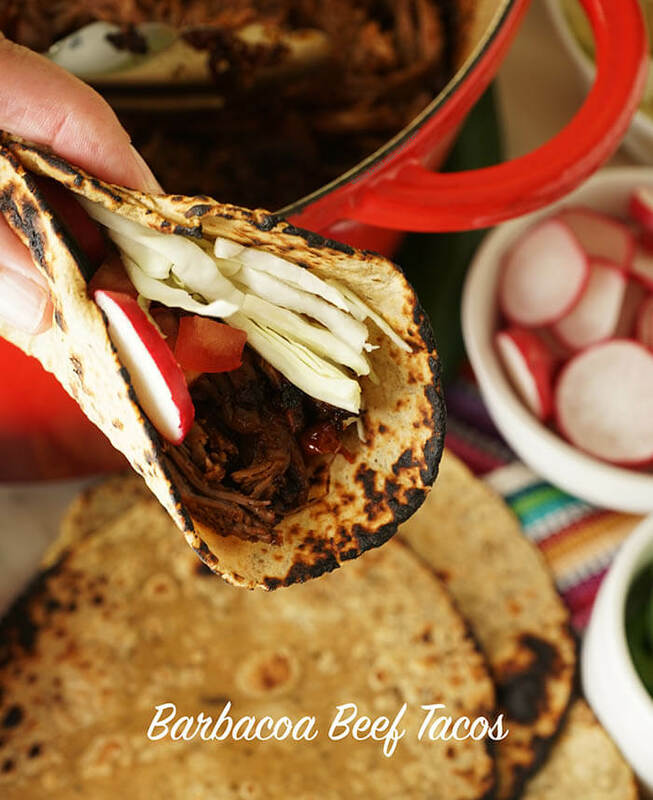 Barbacoa Beef Tacos – braised and slow cooked until the meat is fall apart tender! Let’s get started. First prepare the spice mix. Measure the cumin, garlic, coriander, chili powder, oregano and salt – combine and mix together well, set aside. Next prepare the roast – I used a 3 1/4 pound rump roast. Using a paper towel, blot the meat to remove the moisture. Then coat lightly with olive oil, season generously with salt and pepper. Sear it well on ALL sides – I’m talking a brown crusty sear. Five minutes per side. 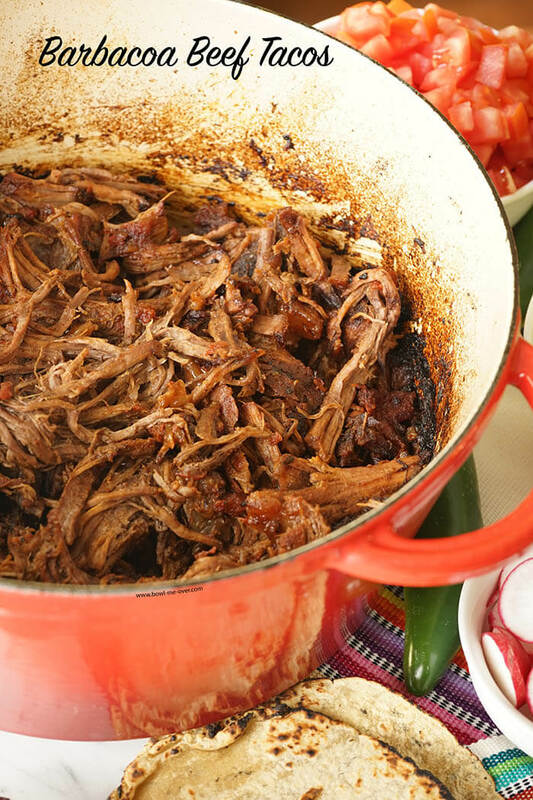 Barbacoa Beef Tacos can’t get any easier with this slow roasted meat. Remove the roast from the pan and add onions and saute for five minutes, after five minutes add a can of fire roasted and half the seasoning with half the spice mix. After five minutes, nestle the roast into the sauteed onions and tomatoes. Sprinkle with the remaining spice mix. Cover tightly and insert into a 350 degree oven for three hours. When complete shred with two forks. 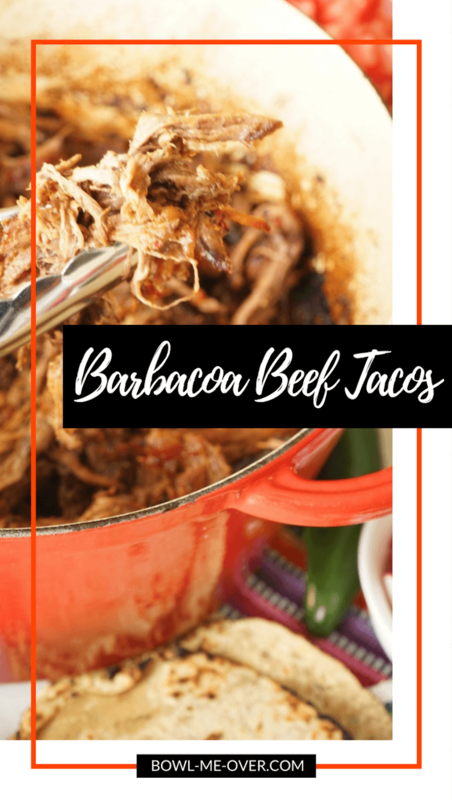 Barbacoa Beef Tacos can't get any easier or more delicious with this slow roasted meat. First prepare the spice mix. Measure the cumin, garlic, coriander, chili powder, oregano and salt - combine and mix together well, set aside. Next prepare the roast - Using a paper towel, blot the meat to remove the moisture. Then coat lightly with 1 tbsp olive oil, season generously with salt and pepper. Sear it well on ALL sides - about five minutes pre side. Remove the roast from the pan and add onions and sauté for five minutes, then add a can of fire roasted tomatoes and sprinkle with half the spice mix. Stir well to combine. Then nestle the roast into the sautéed onions and tomatoes. Sprinkle with the remaining spice mix. Cover tightly and insert into a 350 degree oven for three hours. When complete shred with two forks. 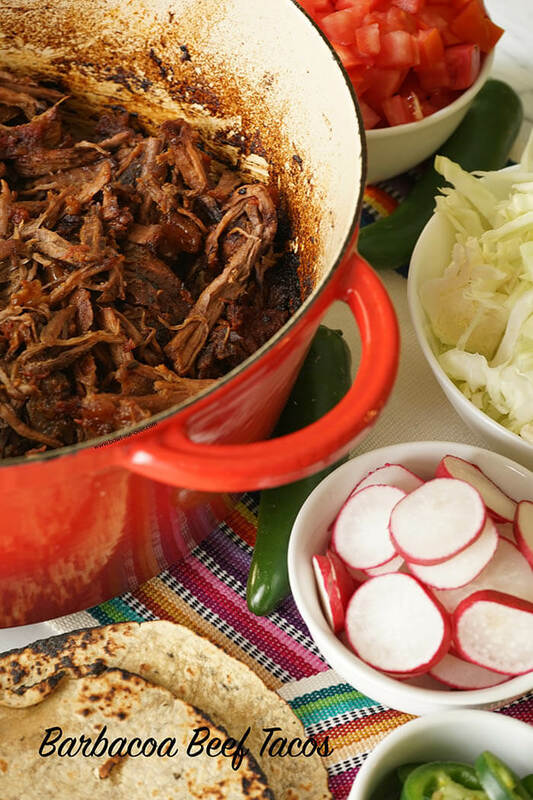 Slice and dice your favorite toppings, toast the tortillas and prepare yourself for an amazing meal! 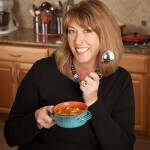 Debra Clark blogs over at Bowl Me Over where she shares her love of all things in a bowl! Soups, stews, salads, Buddha bowls, ice cream â€“ you name it! All are delicious and full of flavor. Most are quick, easy and healthy too! I love the delicious simplicity of these tacos!